"Cooking Up Healthy Choices is a learner-centered curriculum of cooking demonstrations that highlight seasonal produce and allows students to observe cooking techniques, deepen understanding of nutrition concepts, and experience recipes using all five senses. The recipes featured in Cooking Up Healthy Choices are represent foods from different cultures, and include a variety of fruit and vegetables. 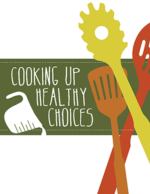 This cooking demonstration curriculum supports California Nutrition Education Competencies. This curriculum is a free, downloadable resource. The "Go Glow Grow" curriculum is designed to meet the specific needs and abilities of preschoolers. It provides opportunities for younger childen to actively learn about healthy eating and exercise. Research tells us that the early years are especially important for establishing habits that will last a lifetime. Encouraging healthy eating and ample physical activity during the preschool years will have long-term benefits. Through this curriculum preschoolers will make the connection between eating healthy foods and being able to Go, Glow, and Grow. (Pre-K) Go Glow Grow -For use of this curriculum please contact the office. "Happy Healthy Me...Moving, Munching, and Reading Around MyPlate" is a nutrition and literacy curriculum that helps children become aware of food and nutrition by reading storybooks with food-related themes and then participating in hands-on nutrition education and physical activities. (Pre-K-Grade 1) Happy Healthy Me For use of this curriculum, please contact the office. (K- Grade 1) My Amazing Body. For use of this curriculum, please contact the office. "Good for Me and You" is a nutrition curriculum that allows students to explore what is good for healthy body and lifestyle, study My Plate, and are introduces to the concept of nutrients and what they do for their bodies. They learn that eating breakfast every day, drinking healthy beverages, exercising and keeping food safe to eat all are good to their body. (Grade 2) Good for Me and You For use of this curriculum, please contact the office.
" Eating Healthy from Farm to Fork...Promoting School Wellness" is a nutrition education curriculum that makes the connection between local food systems, garden-based learning, school food service and the establishment of healthy habits. The lessons actively engage the children in learning about healthy choices for food and fitness. (Grades K-3) Eating Healthy from Farm to Fork. For use of this curriculum, please call the office. "It's My Choice...Eat Right! Be Active! is a nutrition curriculum where students examine the key nutrients provided by each of the five food groups of MyPlate and learn how to make healthy choices. They identify how vitamins, minerals, carbohydrates, and proteins provide the essential building blocks needed for good health. (Grade 3) It's My Choice...Eat Right! Be Active! For use of this curriculum, please contact the office. "Teens With Inter-Generational Support" focuses on gardening and how the foods we grow are used in our bodies as building blocks and as energy providers. Students from Kindergarten through eight grade are given the tools to plant and care for a garden. This curriculum is flexible and the lessons can easily be used in a classroom, after-school program, or club. "Serving Up MyPlate" is a new collection of classroom materials that helps elementary school teachers integrate nutrition education into Math, Science, English Language Arts, and Health. This yummy curriculum introduces the importance of eating from all five food groups using the MyPlate icon and a variety of hands-pn activities. Students also learn the importance of physical activity to staying healthy. (Grades 1-6) Visit the Team Nutrition web site to learn more! Power Play encourages students to eat fruits and vegetables every day and gives creative ways for the students to successfully do so. Children at this age are assuming more responsiblity for their own healthy and well-being. Power Play is designed for mazimum learning using integrative and fun activities and taste-testing to hold the interest of this age group. "Nutrition to Grow On" is an innovative curriculum for grades four through six that offers teachers a direct link between the garden and nutrition education. Nine Lessons are designed to teach children and their families about nutrition by relating each lesson to a garden activity. The curriculum uses the garden to integrate disciplines, including science, mathematics, language arts, history, environmental studies, nutrition and health, while reinforcing the California academic content standards. This a free, down loadable resource. 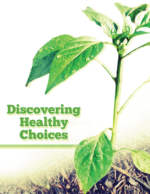 Discovering Healthy Choices is a learner-centered, garden-enhanced nutrition curriculum that was developed for the Nutrition Education & Promotion component of the Shaping Healthy Choices Program. The objective of this curriculum is to facilitate understanding of nutrition concepts and development of problem-solving skills so youth can make evidence-based decisions about the foods they eat. "Eat Fit teaches students to get goals to establish the personal health habits appropriate to the changing needs of adolescence. With Eat Fit, students explore and practice the skills necessary for a physically active lifestyle and healthy food choices. "Nutrition Voyage: The Quest to Be Our Best" is a curriculum developed by the Department of Agriculture's Food and Nutrition Service who invites you to explore new Team Nutrition lessons for grades 7 and 8. (Grades 7-8) This resource is now available in print by using the online order form. "Hunger Attacks / Money Talks" is a curriculum designed to teach teens that the food they buy not only affects the amount of money they spend, but can also affect their health. The mission of Agriculture in the Classroom is to increase awareness and understanding of agriculture among California's educators and students. You can find free or low-cost teacher-tested and scientifically sound classroom materials to enhance the educational experience of K-12 students, including materials in Spanish, a "Gardens for Learning" resource guidebook, "Resources for Every Season" installable software that includes an entire collection of teacheer resources, and a "Teacher Resource Guide" search engine to help you find more specific resources. Since 1919, Dairy Council of California has been an innovator in nutrition education and the dairy industry's contribution to community health. We produce balanced nutrition education programs and resources, which are free in California, for schools, health professionals' offices and workplace wellnes program.